Excerpted from The Gospel according to Mark, by Julie M. Smith, p. 188-196. 23 And it happened on the Sabbath that he went through the grain fields. And his disciples began to make their way, plucking the grain. 24 And the Pharisees said to him, “Look, why do they do on the Sabbath that which is against the law?” 25 And he says to them, “Did you never read what David did, when he had need and was hungry, him and those with him, 26 how he went in to the house of God in the time of Abiathar, the high priest, and ate the consecrated bread—which is unlawful for any to eat except the priests—and he gave some to those who were with him?” 27 And he said to them, “The Sabbath was made for the sake of people, and not people for the Sabbath.” 28 So the son of man is even master of the Sabbath. 2:23 And it came to pass: It is likely that Mark used this phrase to create a biblical sound to his text, making it another example of Mark’s irony: “a passage in which Jesus’ disciples are to be accused of violating a biblical law begins with the Old Testament formula ‘and it came to pass.’” For the perceptive reader or listener, this phrase would contribute to the redefinition of what it means to be scriptural. This entry was posted in Julie M. Smith, Mark, Mark 2 on March 8, 2019 by Administrator. This section is excerpted from The Gospel according to Mark, by Julie M. Smith, p. 156-171. It includes the New Rendition, Notes on each verse, and an Analysis. 2:1 And again he entered into Capernaum after some days: It is unclear whether “after some days” modifies “entered” (he entered after some days) or “noised” (his presence was not widely known until some days after he entered). Either way, the phrase prevents a conflict with 1:45 (where Jesus couldn’t enter into the towns), either by indicating that enough time had passed so that the crowd had died down (if it modifies “enters”) or that Jesus entered the town quietly so that no crowd gathered (if it modifies “noised”). Peter’s house, since that was the last house mentioned (1:29). This entry was posted in Julie M. Smith, Mark, Mark 2, Miracles of Jesus on March 1, 2019 by Administrator. Is There a Mistake in Mark 2:26? The whole phrase is a later addition. Perhaps the most puzzling aspect of the text is that it is difficult to understand why Jesus would have made reference to any high priest, as it is not relevant to the story. So perhaps this phrase was an early (and incorrect) gloss. This would explain why the line is missing from Matthew and Luke: it was not included in their copies of the Gospel of Mark. The earlier reading, referring to Abiathar, is a textbook example of “the mistakes of men” that can occur in a record: either Mark (or his source) erred in naming Abiathar here. Because Abiathar was associated with David as the high priest during his reign, it is an understandable mistake. Most scholars agree that the text is in error; the other theories come mostly from those committed to the inerrancy of scripture. While the error is not terribly significant, it does raise an interesting question: does the mistaken referent stem from Jesus or from Mark (or his source)? If it was Mark’s or his source’s error, then we have an instance where Mark did not correctly record Jesus’ words. If it was Jesus’ error—an option most LDS would not find acceptable, although perhaps some readings of Luke 2:52 (“and Jesus increased in wisdom”) would permit such a position—then that would speak to the nature of his mortal limitations. See Bruce M. Metzger, A Textual Commentary on the Greek New Testament (Stuttgart: United Bible Societies, 2001), page 68. See William L. Lane, The Gospel According to Mark (Grand Rapids, MI: William B. Eerdmans Publishing Company, 1974), 116. See Robert H. Stein, Mark (Grand Rapids, MI: Baker Academic, 2008), 146. Title Page, The Book of Mormon. Note that both Matthew and Luke omit any reference to the high priest. See C. E. B. Cranfield, The Gospel According to St Mark (New York: Cambridge University Press, 1959), 116. This entry was posted in Julie M. Smith, Mark, Mark 2 on October 9, 2015 by Administrator. When Jesus heard it, he saith unto them. Note that Jesus is answering a question that was directed not to him but to his disciples. There may be a contrast between the scribes who see and Jesus who hears: the scribes are reacting to Jesus’ actions but Jesus is reacting to their words. Later in Mark, the distinction between words and deeds will become more pronounced. They that are whole have no need of the physician but they that are sick. Because a similar sentiment can be found in other ancient writings, it is likely that Jesus is quoting a proverb here. Allusion: Exodus 15:26. In that passage, the Lord announces “I am the Lord that healeth thee.” If that text is alluded to here, then it is an important piece of self-revelation as Jesus identifies with the God of the Hebrew Bible. I came not to call the righteous but sinners to repentance. “To repentance” is missing from the oldest manuscripts. It may have been added to harmonize with Luke 5:32; Luke may have added it to explain why Jesus did not call the righteous. “I came” probably does not refer to Jesus’ presence near the Sea of Galilee but rather to his mortal mission; even some non-LDS scholars think that it points to Jesus’ awareness of and teaching about the pre-existence. Jesus is doing the ancient equivalent of putting air quotes around “the righteous,” meaning that he is not claiming that there is a group of people who can be called righteous, but rather gently mocking the scribes’ (incorrect) use of the word. Jesus’ statement “satirizes the Pharisees’ claim to have achieved righteousness by separation from sin.” It is even possible to translate this word as “self-righteous.” So this would not imply that there were people to whom Jesus offered nothing, but rather that there were people who did not respond to his call because they considered themselves to be righteous. This statement is a subtle but provocative way for Jesus to get his audience to consider whether they are completely righteous. The statement can be read as dialectical negation, a form of speech meant to emphasize the positive half of the statement. Thus no great emphasis should be placed on whether Jesus was calling the righteous; the point is that his ministry gives more emphasis to sinners. While the previous verse has multiple references to publicans and sinners, publican drops out of Jesus’ statement here. This breach of the pattern may be Jesus’ subtle commentary that the tax collectors were not sinners of a special class, but no different from any other sinner. Jesus is teaching that sin in another person is not a reason to separate from that person. Because everyone sins, a separatist mindset would either require withdrawing from all human society or ignoring some sins. The Pharisees’ focus is on what effect the sinners will have on Jesus; Jesus’ focus is on what effect he will have on the sinners. Jesus presents an analogy between sin and sickness; this is part of a theology of the atonement that develops gradually throughout the Gospel. The analogy subtly teaches that forgiveness for sins is outside the reach of any human; it points to the need for a mediator (a doctor, one who can atone). Jesus’ statement puts an entirely different spin on the calling of the disciples: they were called not because they were (already) perfect or (already) excellent leaders, but because Jesus called the sick who needed him to heal them so that they could become perfected. The Hebrew Bible develops the idea of the messianic banquet–a future time of harmony and celebration between God and humans that is symbolized by a feast. It is possible to see this meal as a foreshadowing of the messianic banquet, which makes the presence of “sinners” all the more meaningful because it teaches that they also have a seat at God’s table. See N. T. France, The Gospel of Mark: A Commentary on the Greek Text (Grand Rapids, MI: William B. Eerdmans Publishing Company, 2002), 135. See C. E. B. Cranfield, The Gospel According to St Mark (New York: Cambridge University Press, 1959), 106. Joel Marcus, Mark 1-8 (New York: Doubleday, 2002), 231. See William L. Lane, The Gospel According to Mark (Grand Rapids, MI: William B. Eerdmans Publishing Company, 1974), 228. See Robert A. Guelich, Word Biblical Commentary: Mark 1-8:26 (Dallas, TX: Word Books, 1989), 104. This entry was posted in Julie M. Smith, Mark, Mark 2 on September 2, 2015 by Administrator. 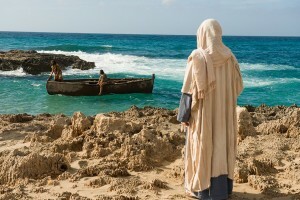 There are many similarities between Levi’s call in Mark 2 and the two call stories (of Peter and Andrew and James and John) in Mark 1 (see full text below): the seaside setting, the description of the future disciple going about his daily tasks, Jesus’ abrupt command to follow, and the disciples’ instant obedience. There are no similar call stories after this one; we can either assume that all disciples received similar calls but Mark saw no need to record them after the pattern was established, or that they were not called as Simon, Andrew, James, John, and Levi were. Levi has a very different occupation and social role than the four fishermen. While Jesus was able to make symbolic allusions to the Hebrew Bible by calling fishermen, calling a tax collector was a shocking thing to do: it made him look sympathetic to the Romans and would have offended Jewish sensibilities. In fact, this story isn’t so much about the call of Levi per se as it is about who Jesus thinks is fit to be a disciple—and his answer would likely have stunned just about everyone. It is possible that Levi knew the four fishermen and had collected taxes on their catch (and kept some as his own payment). If so, one can only imagine the dynamics among the disciples as Levi is welcomed into the circle of brotherhood. In a sense, the call of Levi represents a heightening of the previous call stories: while it would have been possible for the fishermen to return to their fishing, either occasionally or full time, it would not have been possible for Levi to resume his post after abandoning it. See C. S. Mann, Mark: A New Translation with Introduction and Commentary (Garden City, NY: Doubleday, 1986), 129. 14 And as he passed by, he saw Levi the son of Alphæus sitting at the receipt of custom, and said unto him, Follow me. And he arose and followed him. 16 And when the scribes and Pharisees saw him eat withpublicans and sinners, they said unto his disciples, How is it that he eateth and drinketh with publicans and sinners? 17 When Jesus heard it, he saith unto them, They that arewhole have no need of the physician, but they that are sick: I came not to call the righteous, but sinners to repentance. This entry was posted in Julie M. Smith, Mark, Mark 1, Mark 2 on August 25, 2015 by Administrator. Who is “Levi the son of Alphaeus” in Mark 2:14? The relative (in this case, Alphaeus) was known to Mark’s audience. Levi might be the brother of James (which is a helpful data point, but doesn’t solve the problem). “Levi” might be another name for “James.” (Some manuscripts read “James” instead of “Levi” here, but that is almost certainly a later reading.) It was not uncommon for people to be known by more than one name; we know that Jesus himself renamed a disciple on at least one occasion although, unlike with Simon Peter, there is no story in the text describing a renaming of Levi. It is possible that this might not even be the same “Alphaeus;” there could be no relationship whatsoever between Levi and James. The reason that Levi is not mentioned on any of the lists of the Twelve is because Levi was not one of the Twelve. 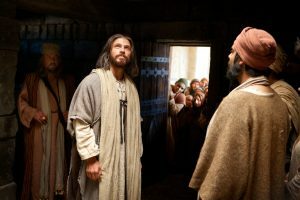 This story states that Jesus called Levi to follow him but does not mention a specific calling; it is certainly possible that Jesus called Levi to a different role. The word “Levi” could be a tribal marker (“the Levite”) and not a proper name. The idea of a Levite tax collector would be most ironic, since tax collectors were regarded as particularly unclean while Levites needed to be clean to perform the temple rituals. But most scholars do not accept reading “Levite” here since it would be odd for Jesus to call someone without his name being included in the story. Regardless, the emphasis here is not on Levi’s identity, but the fact that he was a tax collector. Save the parallel account in Luke 5:27. See Ben W. Witherington, The Gospel of Mark: A Socio-Rhetorical Commentary (Grand Rapids, MI: William B. Eerdmans Publishing Company, 2001), 120. This entry was posted in Julie M. Smith, Mark, Mark 2 on August 19, 2015 by Administrator. By Eric D. Huntsman. Cross-posted at New Testament Thoughts. This entry was posted in Eric D. Huntsman, Luke, Luke 7, Mark, Mark 1, Mark 2, Mark 4, Miracles of Jesus on February 17, 2015 by Administrator. This entry was posted in Eric D. Huntsman, Luke, Luke 5, Mark, Mark 2, Matthew, Matthew 9, Miracles of Jesus on February 12, 2015 by Administrator.